SLO County supervisors continue to hash out what will become the local rules for the emerging marijuana industry, with the board set to meet on Nov. 27 for the fifth time in less than two months to discuss a cannabis land-use ordinance. COMING INTO FORM? The state released a set of regulations for the emerging marijuana industry on Nov. 16, but counties like San Luis Obispo are considering tighter restrictions, like a ban on outdoor cannabis grows for personal or caregiver use. The latest draft of the policy sets tight restrictions on marijuana activities in SLO come Jan. 1, 2018, when Proposition 64 takes effect—per a "go slow" approach by supervisors John Peschong (1st District), Lynn Compton (4th District), and Debbie Arnold (5th District). Those supervisors are in favor of making the 141 cannabis growers who successfully registered with the county last year as co-ops or collectives eligible to receive cultivation permits come 2018; banning both medical and adult-use storefront dispensaries in all unincorporated areas; and restricting personal and caregiver cultivation to six plants total per site (not per patient) and indoors only; among other restrictions, according to planning staff. Thus far, the local rules have been crafted without fully knowing how the state would regulate the market. That changed on Nov. 16, when the state Department of Public Health, Food and Agriculture, and the Bureau of Cannabis Control released long-awaited "emergency regulations" for the macro market. The rules contain some surprises to industry members and elements that are likely to affect the local discussion in SLO County. For instance, a previously assumed 1-acre maximum grow site through 2022 was lifted in the regulations, so now there's no size limits on cannabis farms. That has small growers statewide worried for a quick corporate takeover of the industry. "The challenges of regulating cannabis will be much more severe if we open the floodgates to large-scale mega grows too quickly," read a California Growers' Association petition urging the state to keep a 1-acre cap. "That is why Prop. 64 delayed the issuance of large-scale license until 2023." The lack of a state limit on acreage could mean that the SLO County supervisors will revisit their own acreage limits. As it's drafted now, the ordinance doesn't address a maximum outdoor grow size, but it does set minimum acreages required to have a grow varying by zoning—10 acres minimum for agricultural zones, 20 acres for rural lands, and 50 acres for residential rural—which some local industry members complain are onerously large. Another aspect of the state rules that could intertwine with the county's is the regulation of edibles and cannabis product marketing. The supervisors attempted to place a prohibition on edibles in the county based on a worry that animal-shaped edibles like "gummy bears" would attract youth. But per the recently release state regs, edibles in the shape of "people, animals, or fruit" will be prohibited. In addition, marketing that appeals to children, like cartoons or the word "candy," are also outlawed. The state also set tetrahydrocannabinol (THC) limits on adult-use edible products—another concern of the county supervisors—of 100 mg. Individual local cannabis industry stakeholders are reluctant to go on the record about the county ordinance as the supervisors near the finish line. The overall sentiment varies, with some growers broadly critical of the cap on cultivation and ban on retail dispensaries, and others griping about smaller details that, if left unchanged, would have negative repercussions. 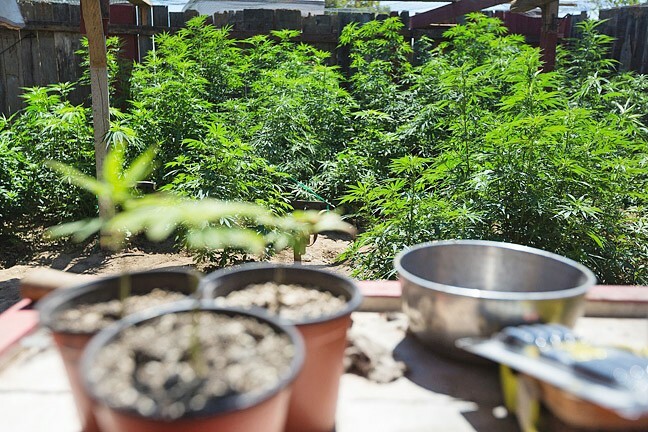 The ban on outdoor personal and caregiver cultivation has been criticized as an energy waste and a fire hazard. Limiting caregiver cultivation (people who grow cannabis specifically for medical patients) to six plants total, and not six plants per patient, is under the microscope, as well as the minimum acreages required to allow commercial cultivation. The SLO County Cannabis Business Association (SLOCBA) has come out in strong opposition to the supervisors' policy direction, starting an online petition that has 760 signatures as of press time asking the board to reconsider its stance. "The current attempt by the SLO County Board of Supervisors to limit, restrict, and ban the number of legal cannabis farms, applications for permits, and retail stores in San Luis Obispo County, is a direct attempt to force legal cannabis farming and sales from the county," the SLOCBA petition reads. "If these unnecessary and punitive restrictions are enacted, significant economic loss will result." SLOCBA President Marie Roth said engaging with the county's regulation process has been frustrating and that members aren't happy with the restrictive approach. But she added that whatever is ultimately adopted, "we will take it and do our best with it." Jason Kallen, a cannabis grower and the president of the SLO County chapter of the National Organization for the Reform of Marijuana Laws (NORML), offered an optimistic view. He said compared to other counties in Central California, SLO is taking a more open-minded tack, pointing to proposed bans on outdoor commercial cultivation in Monterey County, as well as tight restrictions across the Central Valley as comparison points.